Ranveer Singh has been taking his style and fashion a notch higher with his film Gully Boy's promotions. While many questioned his choices, just like his films, the actor has been proving that only ‘he’ can pull it off with immense ease. On Wednesday, the actor sported a ‘gangstar’ style look for promotions and we are actually quite impressed. He looked killer in it and stayed true to his role of Gully Boy. Ranveer will be seen alongside Alia Bhatt in the movie which is directed by Zoya Akhtar. The movie releases on 14 February 2019. This is the first time Ranveer and Alia have collaborated for a movie. Vicky Kaushal, whose upcoming projects include Karan Johar's grand ensemble film Takht, believes in setting his journey as an example for others and not really to follow others' journey. Asked what makes him a game changer, Vicky told a publication via email, "I guess following my gut and not really going by the rules of the book. "As an actor, I have not really been stuck up with the kind of work that people around me are doing. If it's a protagonist's part, a secondary part or debuting with a film like Masaan, all these go against the textbook laws for any upcoming actor. Whether it is Masaan, Zubaan, Sanju, Raazi, Love Per Square Foot, Lust Stories or now Uri -- Vicky has showcased his talent across a diverse range of roles. He explained, "I have not really cared about what the norm is. I want to set my own example. I want to set my journey as an example to others and not really follow anybody else's journey." The actor is a part of Chandon's The Party Starter 3.0 series. It salutes people across various genres that have made a difference in their field. On Uri and its success, he said, "It's one of those experiences that have been extremely stimulating and enriching as an actor and as a human being because when you get to wear that uniform to play a character of an Army man, it brings a lot of responsibilities on your shoulders. "I am having a great time. I think Kabir Singh is very special and Arjun Reddy was amazing. As such it's very stressful making the remake, especially when it has been loved so much," Shahid told media at the Filmfare Glamour and Style Awards 2019 on Tuesday here. Arjun Reddy, starring Vijay Deverakonda, was released in 2017. On his Valentine's Day plans, Shahid said, "Meera (Meera Rajput Kapoor) and I are very spontaneous. We do things we feel correct doing in last minute. Kiara Advani plays the female lead opposite Shahid Kapoor in Kabir Singh. It is written and directed by Sandeep Vanga and produced by Cine1 Studios and T-Series. Kangana Ranaut stirred controversy recently over her statement on how Bollywood never stood up for her. Recently, in a conversation with media, Gully Boy director Zoya Akhtar spoke about the controversy. Zoya reacted to Kangana's comment on B-town celebs not being for her during the release of her films. Akshay Kumar and Kareena Kapoor Khan come together for this show! Yesterday, the Khiladi of Bollywood, Akshay Kumar, was spotted shooting for Karan Johar's Good News along with co-star Kareena Kapoor Khan. The sequence, which started early in the day, wrapped-up around 9 at night, and during the shoot, Akki was seen riding a bicycle. Ranveer Singh's wacky fashion sense has been the talk of B-town since forever. To be honest, no one can carry such outfits with ease as Ranveer does. And we bet no one will be able to do so in future. While many disapprove of his weird outfits, his wife Deepika Padukone is all hearts for it. Last night at an event, when Deepika was asked by media if she borrows anything from her husband's wardrobe, without giving any thought, the actress said that she has borrowed a lot of his sweatshirts and T-shirts. Whereas, when asked if Ranveer has ever borrowed any of her clothing or accessories, much to our delight, she revealed that the actor does take her sunglasses at times. Well, that's quite a revelation we say. Ranveer Singh and Alia Bhatt's Gully Boy will be a huge hit! Ranveer Singh and Alia Bhatt starrer Gully Boy is all set to hit the screens tomorrow. Since Ranveer and Alia enjoyed blockbuster success with their last releases - Simmba and Raazi respectively - we are expecting Gully Boy to repeat that kind of success at the box office. We have already told you that the film, which showcases the journey of a rapper's life, is releasing on Thursday as a Valentine's Day treat to the audience and it seems that this promotional strategy has worked for the makers. The film has registered good collections of around Rs 8 crore in the advance booking report. Circuits like Mumbai, Pune and Bangalore have contributed maximum in the business while Kolkata and Delhi are gaining momentum at the ticket windows. Till tomorrow, the film will witness a huge jump of around 40 to 45 per cent as youth, especially college-going crowd, prefers to go to cinema halls on 14 February (Valentine's Day). Taimur Ali Khan is not only a star kid but an internet sensation. In fact, he has a new fan and it's none other than Kiara Advani. 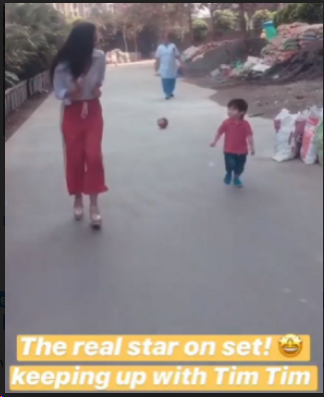 It so happened that the actress, who is currently shooting for Akshay Kumar and Kareena Kapoor Khan starrer Good News, met Taimur who accompanied mommy on the sets. And then a race followed and a defeated Kiara later revealed who the star really is. Bhumi Pednekar learns from her every movie! In just a short span of four years, actress Bhumi Pednekar didn't only establish her own market but also became a commercially viable star. In fact, after Varun Dhawan, she is the only star, who has 100 per cent success ratio at the box office. Well, you might have been bowled over by her performance and the way she slips into her character, but you'll find it interesting that the 29-year-old actress has a unique ritual, where she collects some really special things from every film that she does. Priyanka Chopra and Nick Jonas are presently busy giving people couple goals, and their lovey-dovey pictures are making us lovesick, especially when Valentine's Day is around the corner.